The Department for Transport’s impact assessment highlights the complexity of the existing legal framework and identifies the recommendations from the CARS21 High Group report as the foundation for the simplification of the regulations for L category vehicles (including motorcycles). The recognition of the recommendations from the CARS21 High Group is fundamental because these set out the criteria for the proposals – which, with the exception of the European Economic and Social Committee (Click Here – pdf 55kb) the Commission and the EU parliament have since ignored. “All automotive legislation should be performance-oriented, technology-neutral, and over-prescriptive regulations should be avoided. The principle that regulations should only fix objectives in terms of measurable performances, not solutions, should be strictly respected. If there are exceptions, the criteria to accept them should be given”. Alternatives to regulations should be considered, including market-driven solutions and voluntary agreements (…). Well-designed voluntary agreements, particularly those that encourage changes in consumer behaviour, can in some cases deliver public interest objectives in a quick and effective way”. For these reasons, we disagreed on the positions taken by the EU Commission, European Parliament and the Department for Transport with regards to Advanced Braking Systems (ABS) and Automatic Headlights on (AHO), but also because the basis for their assumptions on the (lack of) reduction of motorcycle casualties in Europe was unsound, fundamentally flawed and outdated. We agreed with the DfT’s assessment with regards to emissions, durability requirements and RMI, but we disagreed with their assessment regarding On Board Diagnostics because as highlighted in the LAT report (Click Here – pdf 2.6mb – Page 111 and also page 14) (which was carried out on behalf of the Commission and then ignored) there are difficulties in monitoring the probability of emission malfunctions because there aren’t solid experimental data on the behaviour of actual motorcycles as well as difficulties in the technical implementation of catalyst efficiency monitoring in motorcycles. In this case and in response to the question regarding “In Service Conformity Checking”, we argued in favour of a more appropriate method of check conformity which should be carried out through regular road worthiness test or MoT. We wrote that we agreed with the DfT’s assessment of the cost benefit analysis for anti-tampering, and explained that we have been in correspondence with the Commission on anti-tampering measures as well as on various aspects of the proposals. This correspondence in relation to the anti-tampering requirements took place over 2010 and 2011 and we established firstly that there was no evidence of a widespread problem which the Commission acknowledged and in the case of tampering of mopeds and small motorcycles, we pointed out that these were already subject to anti-tampering measures. 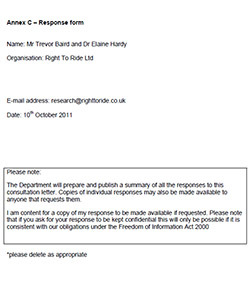 In September 2011, we reported on the failure of the Transport Research Laboratory to identify “harmful tampering” which we offered to the DfT as further evidence that the so-called problem does not justify the anti-tampering measures that the Commission aims to introduce (Click Here – pdf 619 kb – Moving the Goal Posts! EU Commission and the TRL Anti-tampering study). Further to this, we would like to highlight the fact that the Commission has yet to define the anti-tampering measures and subsequently the identification of positive modifications which are allowed. Finally in response to the last question (other comments) we wrote that we have major concerns due to where the proposal sits at present within the legislative process. It is our understanding that the proposal is scheduled to be voted on before the regulations, delegated acts and the adoption of harmonised international standards, have been agreed on. We explained that all these issues need to be formulated before any agreement or alignment within the Council of Ministers and before any vote within the EU parliament takes place regarding the Commission’s proposal and subsequent amendments put forward by the IMCO committee. This seems to be a common sense approach as it seems absurd that a proposal for a regulation should be agreed upon without a clear understanding of the outcome. 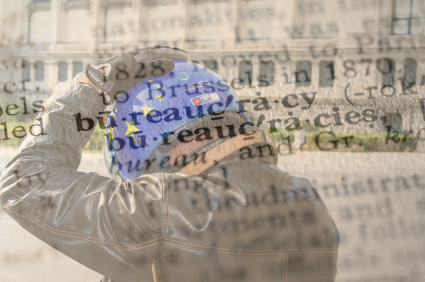 The best way forward is to delay everything, because it is clear that the Commission and EU parliament have got themselves in a fine mess, even ACEM has suggested that the situation has now entered a “Nightmare Scenario”.